Last week I received the new Dover catalogue with a big sale on blankets. The only clothing I own for Gem is a fleece cooler and while that got me through last winter I was worried about attending a February ride without anything to block the wind and rain if it turns into a crappy weather weekend. She will be in her small electric pen without much in the way of shelter although I am thinking about setting up the not-so-EZ up inside the pen for cover if it comes down to it and it is raining all weekend. I thumbed through the catalogue and saw two Amigos that were nearly 50% off: a light weight waterproof shell and a medium. If I ever need a heavy weight blanket down here, I'm moving farther south :) I hemmed and hawed about which to get. I even called and annoyed Dusty at work about it. Being the awesome husband that he is, or maybe he was just super annoyed at my lengthy indecision, he told me just to get both :) I refrained though because there are some other new tack items I want to get and didn't want to be greedy. Eventually I settled on the light weight. 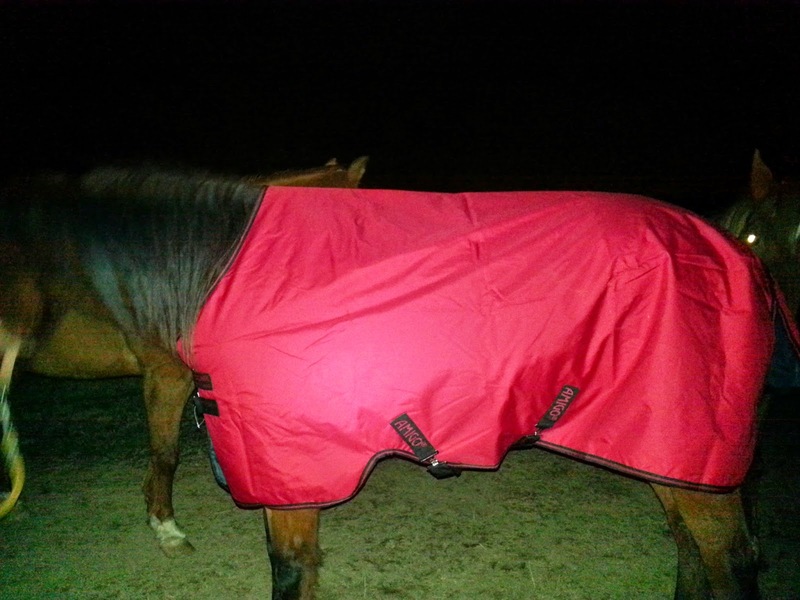 Mainly because it came in red and black and the other didn't, but on a more logical front I figured I could always throw the cooler on her and cover with the light weight blanket during the ride if warmth is needed or just use the light weight if I just need to keep her dry and out of some wind. It is more adaptable. Next year I will pick up a medium weight to add to her wardrobe. The interesting part of this story is that Gem actually went up a blanket size. The last 4 years she has always comfortably worn a 70" with a little room to spare. When I threw the cooler (also 70") on her at Barefoot I noticed that it was actually tight. Not tight enough that she couldn't wear it, but tight enough that I wouldn't want her to spend much unsupervised time in it. When I went to order the blanket, I jumped up to a 72". Anyway...in true life fashion, the Universe made sure to show me the error of my ways and dropped the temperatures down to 10F with a raging wind. Where is that medium blanket now??? I shoulda bought them both. Gem is usually completely naked and does just fine. I know, 10F isn't anything to complain about when compared to you northerners and believe me I feel bad for you all. I lived in Wisconsin for 3 years in a state of constant near freezing to death and don't miss those winters one bit. I do miss my friends though. Up north my rule of thumb was to blanket when it got below 10 and that was with a typically slow build up to those temperatures for Gem to get used to it. It was 60 on Saturday and is now 10 tonight. Thats a pretty big jump and it makes me worried that maybe she won't be so ready to not freeze over night. 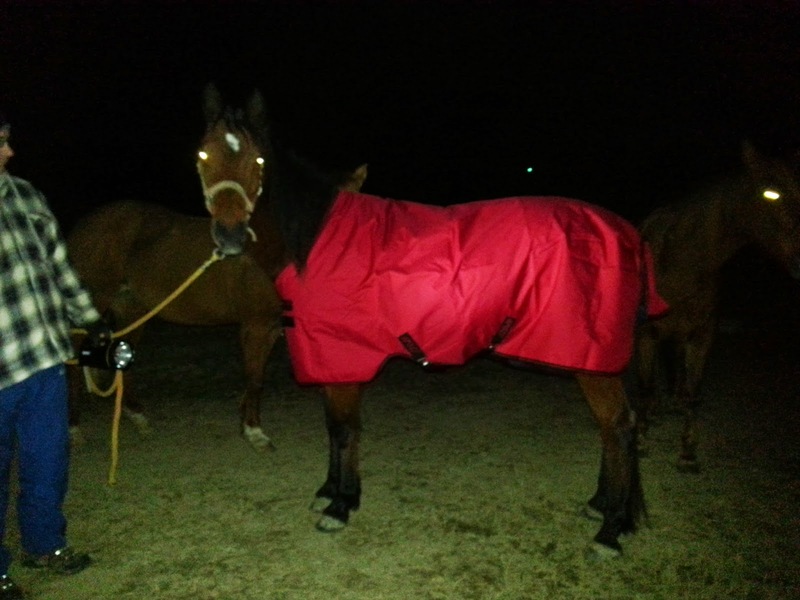 I was worried enough to drive over to the barn at 7pm and fight the wind to put her blanket on her. She was surprised to see me after night fall in the cold thats for sure! As I was trying to figure out how to put it on her (yes, I am really a blanket idiot. My tactic is to just throw the thing on her and move it around until it is relatively horse shaped and work from the chest back) she even strained to put her nose on me with the cutest look of "Whatchya doing back there? I think I really like it!" It made me smile and made my freezing fingers not hurt so bad. I gave her some loving and scratches and snapped a quick photo. The 72" fits really well with enough room to walk comfortably. I guess all the conditioning paid off!!! The problem with putting the blanket on is when to take it back off. The BO won't do it, so I need to either do it tomorrow morning before work when the temperature is still in the low teens, tomorrow night when it drops back to the teens again or Friday. I think I am just going to leave it be until Friday afternoon. Tomorrow's temps are only in the mid 20s (still very cold for down here), but Friday gets back up into the low 40s. She should be fine in it until then. 0F (-22F windchill) here this AM. Yeah, definitely don't miss those temps, but we do miss you guys! !